CITY: The Chaulk Team works with both Sellers and Buyers of all price points in the City of Calgary itself. Our city office is located in the south end of the city in Lake Midnapore and many of our clients live in and around south Calgary. 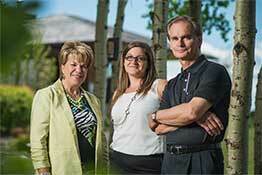 However, with over 40 years of combined experience in Calgary, we have worked all over the city. City properties usually comprise about 40 - 50% of our annual business. COUNTRY: The Chaulk Team has extensive experience in the M.D. Foothills including the Priddis, Millarville, Dewinton, Okotoks, Red Deer Lake/Spruce Meadows, Bragg Creek areas and M.D. Rockyview with various sizes of country residential acreages and land. We have sold and helped clients find and purchase well over 700 properties. Wayne Chaulk is highly regarded by clients and colleagues alike in this special field of real estate with its special challenges and required knowledge. CONDOMINIUMS: The Chaulk Team's agent, Rebecca Chaulk, is a Certified Condominium Specialist. While all members of the Team have worked in both selling and buying for condo clients, Rebecca is our "go to" member for the very specific requirements that often come into play in this niche. LUXURY: With years of marketing and expertise in "higher end" luxury home properties, The Chaulk Team can help market your unique real estate in this category in Calgary and surrounding MD Foothills country areas. RETIREMENT: Baby Boomers and older now make up over 50% of the total Canadian population and their need for different housing at this stage of their lives is enormous. This can be an exciting but also a stressful time for so many in this demographic and that is why team member, Denise Chaulk, has chosen to undergo further training to serve this emerging market. She is a Certified Seniors Real Estate Specialist (SRES) and is ready to help with navigating the many choices available for retirement and semi-retirement living.